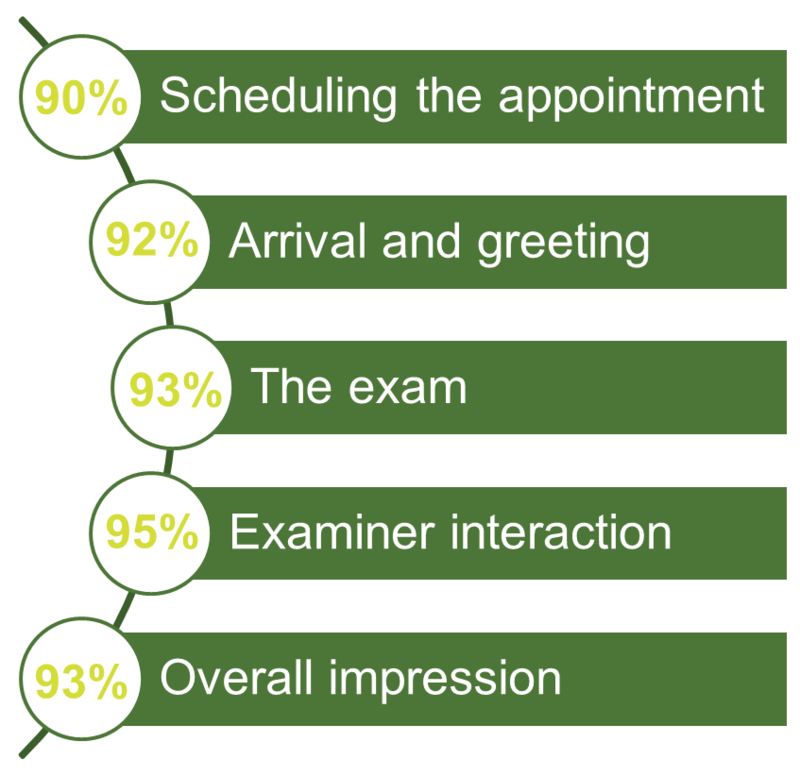 The Mystery Shopper Program acts as a quality measure for the paramedical exam process. This program measures and improves the applicant experience from scheduling through exam completion. It also measures each step of the exam process (blood, urine and physical measurements), to identify possible areas for improvement. Since implementation of the program in 2014, we have seen a three percent increase in the overall impression of the exam process. The “shoppers” acting as an applicant completing their paramedical exam are professionals employed by an independent third party agency contracted by ExamOne. They have been trained on our standard procedures and the expectations of our examiners. After completing the exam process, the mystery shoppers complete a questionnaire rating the process in five areas, and ExamOne’s average performance ratings are consistently above 90 percent. Results of the questionnaire are reviewed by our management teams and shared with the individual examiner for coaching. We want to know what every applicant thinks of their experience so we can use that information to improve the life insurance application process. Our online survey captures this feedback so we know what we did well and where we can improve. Here are just a few things we’ve recently heard from applicants about their experience with ExamOne. In order to gauge how your applicants feel about ExamOne, we use the Net Promoter ScoreSM (NPS®), a customer loyalty metric pioneered by management consultant Fred Reichheld. The NPS is an index ranging from -100 to +100 that is used to gauge a customer’s overall satisfaction with a company’s product or service and the customer’s loyalty to the brand. According to Reichheld, the average American company scores less than +10, and the highest performing organizations score between +50 and +80. In 2015, ExamOne’s NPS was +68.